Fans of forbidden romance, welcome and enjoy, because this book is so good. I had a pretty good idea I’d enjoy this book when I read an excerpt and immediately connect with the main character’s voice. There’s just something special about how Sophia Ramos tells her story, and the more I read, the more I was taken by how eloquent she was without sounding like someone twice her age. I try to think of each fight like an earthquake--a release of pressure that will make things calmer for a while. I try not to think about how, sometimes, earthquakes cause tsunamis. Sophia was smart—like “got accepted into Stanford” smart—and she was pretty funny, too. While her academic life was going more than fine, thank you very much, her home life was a mess. Her mother and “boyfriend/husband” get drunk practically every night and shout in each other’s faces, and Sophia’s only ally inside their house is Dan, her sort of “stepbrother’s”, who also happens to be HOT. The relationship between Sophia and Dan seem innocent enough at first. I LOOOVED their silly teasing and games. The whole throwing popcorn at each other, filling each other’s pants with ice cubes, making funny faces when no one was looking sort of thing really did it for me. I was laughing out loud and smiling like a goon the whole time. I also loved how they kept each other company as their parents tried to destroy their houses during their fights. There was something special about these two people that are so different coming together to give each other strength. But innocent games didn’t last long. This is probably the only thing I wish had gone differently in this story. I wish the transition between friends to “wait, why am I thinking about sexing you” to the actual sexing would’ve been longer. A little slow burn would’ve helped with the tension. But, yeah, when things heated up, I kind of forgot all about more build up because, damn, they were good together. Like hot and forbidden and dangerous and good! For those worried about the stepbrother angle, I say don’t. Dan and Sophia hadn’t grown up together and been taught to think of each other as siblings, hence why she calls him an “almost” stepbrother. The biggest forbidden angle for me is the fact that they live under the same roof and have to do a lot of sneaking around a lot (and all of them are really hot, trust me). The whole “will they or won’t they get caught” kept me turning pages desperately. I don’t know if this book was more on the short side or what, but I read it so freaking fast I couldn’t believe it had already ended. While Sophia and Dan’s relationship were the focus on the story, I also loved the friendship between Hannah and Sophia. They genuinely cared about each other, and even when things happened that pushed them apart, they found each other again and were pretty mature about fixing their broken friendship. Another plus is the writing. I really enjoyed the emotions the author managed to bring out in these characters and how realistic the whole story was. It’s hard to find a good, well-written forbidden romance, but this was definitely a winner. 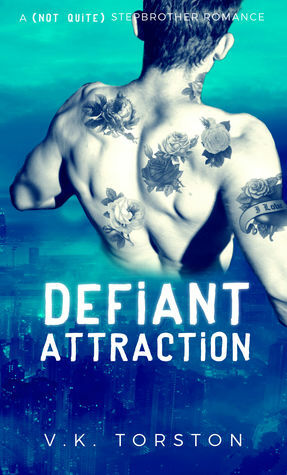 There’s not much more I can say about this book other than, if you’re into New Adult stories and don’t mind a little forbidden romance, then you will not regret reading this.